“What’s so healthy about sweet potatoes?” I’ve got the top 9 reasons to make these tasty yams apart of your diet. 1. 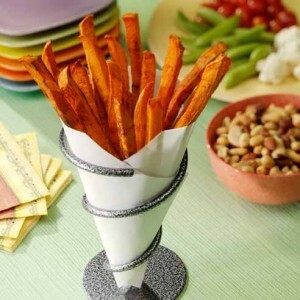 Make sweet potato fries. Who doesn’t like sweet potato fries? (If that’s you, you might want to try them again just to be sure.) And these are extra special. You can munch on eight of them for just 78 calories and one gram of fat, plus two grams of protein. I found an awesome sweet potato fry recipe and included it at the end of this article. 2. Baked sweet potato. Everyone loves a loaded baked potato, but why not try a baked sweet potato instead! Whether it’s baked in the oven or microwaved, top it with a little healthy butter and a drizzle of honey, and you have a side dish that almost doubles as dessert! 3. Sweet potato salad. Try a new twist on potato salad by subbing in sweet potatoes for the regular variety. Not only will it change the flavor of the dish (a little sweeter and more flavorful), but also it’ll provide more vitamin C and fiber than a traditional potato, especially if you keep the skins on. 1. Preheat oven to 400°F. Spray large baking sheet with cooking spray. Peel sweet potatoes; cut into 1/2-inch wide slices and then into 1/2-inch wide strips. 2. Combine Egg Beaters 100% Liquid Egg Whites, chili powder, salt, garlic powder and cumin in large bowl; whisk until frothy. Add potatoes and toss to coat. Spread potatoes in single layer on prepared baking sheet. Spray evenly with cooking spray. 3. Bake 20 to 24 minutes, or until tender and golden. Enjoy!